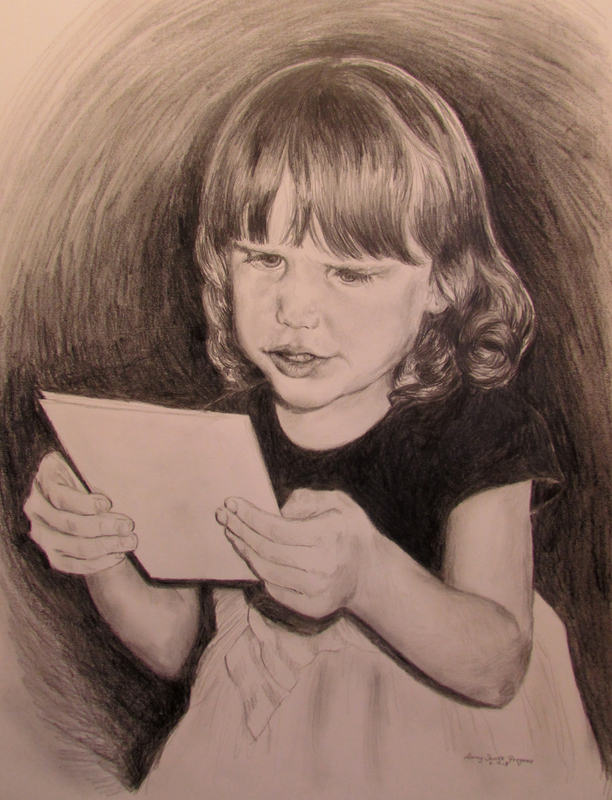 As I prepare to teach a drawing course I drew this pencil portrait of my granddaughter looking at a greeting card. Although not highly finished, it demonstrates a high contrast that helps to make a drawing look convincing. She is much prettier than this rendition and so I will continue to make attempts that I hope with time will be better. When we first start drawing there are two polar opposites that often occur. Either we make the whole drawing too light that may look all right close up but the minute we put some distance between the drawing and ourselves it loses the impact for which we hoped. The other first stage drawing tendency is to draw objects in too high a contrast. This is especially prevalent when drawing a portrait complete with black nostrils no matter how the nose really appears. Contrast like everything else in drawing and painting is a matter of observation and growing in our ability to perceive what our eyes are really seeing (rather than what we “think” we see). Sometimes we think too much! Our art improves as we look and look and look at objects and study what is before us and seek to translate that image into something artistically accurate and visually pleasing.